Christy Clark, the new Premier in British Columbia, has long been an advocate of increasing the opportunities for parents to choose schools for their children. Most people’s response to this is that it sounds good – parents should be able to make a decision on which school best meets the needs of their child. 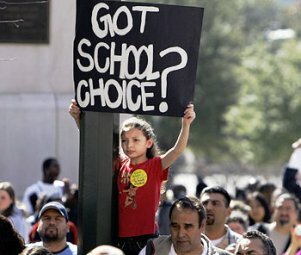 In an ideal world, this may work but more questions arise as we look deeper into who truly benefits from school choice. As most of you know, I believe the autonomy to choose is extremely important in life. Students, staff, and parents need to be provided with equal opportunity to choose how to do things in life. The key word in the previous statement is EQUAL. So I ask the question again: who does school choice truly benefit? The answer: students from middle-class urban households. It would be fantastic to be able to drive across town to participate in a Sports Academy – but the student must have access to a number of assets before he/she can even consider this option. I do not blame any parent for making informed decisions that best suit the educational needs of the child; in fact, I think parents need to be MORE involved in educational decisions. But how does school choice benefit a child from a family without a vehicle? One that cannot afford the tuition to a private school or BC academy? One that lives in a rural community in which the next school is hours away? One that has a single parent working two jobs? From a different angle, if students are choosing to attend schools outside of their neighbourhood, what does this do to the community sense of schools (although this argument will be discussed at another time)? At my previous school, I attempted to bring the Hockey Canada Academy to my school (at a cost of almost $1000/student each semester). The idea is fantastic; students are provided with the opportunity to participate in something in which they are passionate. Unfortunately, as I grew as an educator I began to realize that not ALL students are provided with the opportunity – only those that have the capital. Why is it acceptable that only students who can afford choice schools are provided with the opportunity? We are now seeing schools and districts compete for students. Parents are provided with Fraser Institute Rankings, ‘standardized’ test scores (that are often marked by their own schools), a variety of academies (that often come with an tuition cost), specialized schools, ‘traditional’ schools, and an option of attending an independent school (based on religion, culture, specialization, etc). Schools that refuse to market themselves, teach to the test, or compete with others schools are sometimes seeing parents choose to send their child elsewhere. Apple (2001) states that there is a “crucial shift in emphasis… from student needs to student performance and from what the school does for the student to what the student does for the school.” He also goes on to say that “more time and energy is spent on maintaining or enhancing a public image of a ‘good school’ and less time and energy is spent on pedagogic and curricular substance”. As stated, I am not against choice in education. However, this choice must be available to ALL students so every student in BC is provided with equal opportunity for a ‘personalized learning’ experience. This means that if districts are going to provide specialized schools and academies, all students within the district must be provided with access – in particular, transportation and funding. This also means that rural schools must be provided with funding to be able to provide students with learning opportunities comparable to students in urban communities. Enhance and emphasize math and science, including promoting province-wide competitions to recognize excellence in those fields. Publish detailed information about school programs, achievements, operations and facilities on school-district websites so parents can make informed choices. So parent-based systems reward the haves. They have choices because they have funds, knowledge, transportation, the ability to even home school. And the have-nots are punished. Those children have parents without access to information, without access to transportation (and thus charter choice), without access to their own successful educations as a support system. School choice, as it is now in BC, does not solve the real problems of the hierarchies of class and race that exist within the current system – they actually maintain them. Unfortunately, we often only hear the voices of those with the cultural capital to speak on behalf of their children and we don’t hear the voices of the marginalized. When we hear that a solution to our education system challenges is school choice, we need to question where this voice is coming from – is it a voice that speaks on behalf of ALL students or just his/her child? Clark also goes on to say, “My proposals are designed to involve all the stakeholders in creating a kindergarten to 12 system that truly reflects the needs of students.” I am not sure how providing school choice is a way to involve ALL stakeholders and meet the needs of ALL students. Ravitch (2008) writes that “Democratic education [means] that everyone must be educated as if they were children of the most advantaged members of society”. I realize that the funding formula in BC currently encourages schools/districts to compete for students so they are often forced in the direction of promoting school choice. Most will agree that our system needs to change but school choice, the way it is currently designed in BC, benefits primarily the students from advantaged families; schools need to collaborate, rather than compete, and be adequately funded so programs are not cut but are created so as to offer ALL students within each school REAL choice in their education. Do You Coach or Do You Judge? What’s In YOUR Invisible Knapsack? I like this post, it speaks to me the reasons why school choice and voucher programs are flawed, and you haven’t really touched on your second point about cultural capital. Some parents do not seem to care about what education their children receive and others care but don’t know how to evaluate their choices. Further, school choice programs have been tried and tested in a few places across the US without much success, they don’t improve the system for all kids like you say, they tend to only benefit kids who can afford the transportation and additional costs of other schools. So given that those are some of the issues, what would it take to provide equal opportunity to schools? Would the government have to agree to pay for transportation? Would they need to provide boarding schools for students who live in rural areas? I’m pretty sure that providing democratic options for school choice would be prohibitively expensive. Inequity of choice occurs at every level. From elementary schools that don’t have a band program, to secondary schools that don’t have industrial education programs, to small universities that don’t have Master’s or Doctoral programs, it really is everywhere. A question to consider might be “If we cannot provide these choices to the masses, should we not provide them at all?”–this too is problematic. What I hope for is that every school is able to provide a great education, and if there are schools that have additional programs to augment the great programs that already exist in each school, tremendous. However, we need to make sure that every school is able to provide a well-rounded education first, and worry about the choices after. Chris,another great post. This one really got me thinking, in fact I had to step away let it perculate and then come back. More than anything, I think it is the more subtle message that worries me. What is (will be?) the vision of the new Government in BC? On one hand we have the Ministry (Rod Allen and Cathy Elliot)travelling the province talking about a vision for 21st century learning. One that includes ‘white space’ (Rod’s words) in the curriculum, so educators can go deeper and make learning more meaningful. Starting meaningful and exciting conversations, while at the same time, you point out the Premier’s vision of academies as a means to promote choice and increase engagement. We have some academies in our district, and while beneficial to the students in them, I wonder how they benefit the system as a whole. You point out that too often these academies only increase the gap between the ‘haves’ and the ‘have nots’. I worry that we are really creating private school settings within our public system. I also wonder how we can meaningfully engage our communities in discussion and have them an essential part of school culture, when the school populace no loger represents the community that surrounds it. Chris, this is an exceptional post. You’ve nailed it when it comes to “choice.” Educational options are wonderful, but only when they’re truly accessible to all. If we aren’t willing to probe deep enough to recognize our flawed thinking and design and practices when it comes to “choice,” then we are unfortunately and devastatingly perpetuating the wrongs against those who always get the shaft. Another very thoughtful post! You certainly provide me with food for thought. As a performing arts teacher, I have always disagreed with academy programs and actually refused a position in one way back at the beginning of my career. Schools should be about providing students with quality programming in every area, whether sports, fine arts, or any other specialized area. If we further separate these areas we are doing our students a huge disservice by not providing them with choices and the opportunity to be exposed to areas they might not have been exposed to before. I also feel that our inner city schools are the ones who should have the best our specialist areas can offer as they need it the most. Isn’t it interesting that these are the schools that are closed first when those budget cuts come calling. Great post, but there’s a part you left out. While I think it’s terrific to give parents a choice to have their children attend schools like the ones I mentioned here http://huff.to/gw66E4, you left out some options that I think will have a huge impact in the future. Online education, home education, boarding school, co-op learning centers, travel learning, apprenticeships, and unschooling. In the 21st century we need to think way outside the box. There is no reason school should be place-based or the only game in town. For many (including me) school is the worst possible environment for learning. These other alternatives should also be supported. Additionally, communities need digital divide busting learning centers where everyone can come to get internet access in a safe environment. When access is provided the need to travel a distance to a physical space becomes less of an issue. Add these things to your piece and we’re in agreement. I agree with Lisa. I don’t think it is only about making the system equitable, it is also about re-thinking the system and providing choices that are good for students. Thank you so much for adding to the conversation – this is how we push forward. We are both on the same page that the system needs to change. Going beyond the walls of what we describe as “school” is definitely a start. In BC, there is a push for schools to provide innovative programs to attract students and benefit their own. This is fantastic for those that can access these but hurts those that cannot. Things like home education, boarding schools, travel learning, etc cost a pretty penny and many families cannot afford meals, let alone options like that. So the question for me is: how do we encourage innovation without marginalization? what if it’s not a school of choice.. but learning per choice. the town/district becomes the school…with multiple choices in the various buildings or online or at home, etc. no one is pigeon-holed to one school or one choice. some becomes halls, ie: the town engineering hall, the town art hall, etc..
Love that picture Monika. As long as every student had equal access (ie. transportation, technology, etc), a chance for actual learning to take place in an area of your passion, through dialogue with other passionate learners… Love it. Love this post! You have said it all so well, Chris! You have articulated the complexities surrounding school choice so clearly. I think many speak to it as a good thing, but don’t always realize some of the implications and consequences it could have, even to our future array of choices. Like you have said, choice is great! But choice is not always an option to all, or equally accessed. Each district/province/state will have different things in place for school choice or how parents go about exercising choice, but it still has impacts in broader and various ways, I would think. I worry about the notion that school choice will “fix” or address certain things we may be unhappy about in our current education system. We need to carefully think about how we are to go about ensuring good things and opportunities and supports for all children. Our children will be in world with all eventually. A number of years ago, we did choose to move our children to a different school. It was not much farther from our home, but a difficult walking distance compared to the school they started out at in our zone. But with choosing out of our zone, we could not be offered bus transportation. Luckily we had two cars and flexible schedules to allow us to get them to and from the school. Now, this change was so good for my kids and our family as a whole—no looking back! It made a huge difference in how my kids felt in school and about themselves. I also know that the reasons we chose the school could be the same reasons that other parents would not have chosen the school. No one is more “right” and we all make decisions based on different things. We all have different children with varying needs, temperaments, and learning styles, etc.! We navigate the best we can as parents entrusting schools with our children’s learning and well-being. So, as a “chooser”, I learned a lot. But it certainly led me to think about the families who may not have the same opportunities as we did to exercise choice, or those who would not know how to best to go about that, or would not have been supported in that, or have the means to do so. It was so important to us, but we still had to make a lot of adjustments too. So I have to be concerned when I hear from a parent who is struggling to support their child, but choosing a different school is not an option for them even if it might prove to be the best thing. This speaks to me what we really have to address. How do we ensure that all learning environments can support and be flexible to the needs of children as much as possible, and that choice is not restricted to a few, if need be or necessary. The last thing I wanted to do was to move from our community school!! But it was those “market-based” and “accountability” influences that seemed to impact said community school. Love it, Chris….and I’d take it a step further. I don’t want “equal” access to options, I want “equitable” access to options. The difference is important: Along with the basic ability to take advantage of new options, struggling students from poor backgrounds need MORE choices and BETTER choices than students from affluent backgrounds. That’s the only way a community can honestly claim to care about educating “our” kids instead of just “my” kids. We’ve got to stop being selfish if we want to get serious about closing achievement gaps. The truth is some kids need more support if they’re going to be successful. Choice has to take that into consideration. The point about choice is well taken. While it seems good on the surface it is not as easy in the implementation. My son is faced with a dilemma. Next year he wants to attend a high school with a better academic program for him which is not available in his community school. To attend this progarm will require a 45-60 min bus ride, one way, every day on public transit with 2 transfers. He’s trying, with support, to balance, whether the cumulative inconvenience of a 90 mins daily commute is worth the enhanced program. He’s also interested in robotics, but the school with the robotics program, that he can choose to attend, is a 40 minute drive away. He has the choice to attend these programs, but it isn’t really much of a choice at all. When I go to my store I can choose between 30 different varieties and flavours of pop. That’s real choice. The current school choice system would be like me going to the store for diet Coke and them telling me they have it but I have to drive to a store 50 kms away to get it. I’d quickly change stores, which I guess is what private schools and home schooling are all about. Real school choice would be having a variety of academic programs available to all students in their home schools so they are easily accessible to all, regardless of ability, commitment or resources. Great points about “real choice”, Andrew. This is always a great post to revisit. The conversation in Ontario on this topic recently has been very interesting. Not much choice or variety of program options in my end of the province though. I just thought I would clarify my earlier comment above. In our decision to choose a different school for our children, it meant moving them from a school with “high test scores” to one that had lower scores. Sheila, offering programs of choice in Ontario seems to be largely an urban phenomenon, maybe because of transportation costs. I taught in Toronto and there were lots of options there and my sons go to school in Hamilton and there are also lots there. I know there are programs of choice in Ottawa and London. I think these are all programs where all students are welcome to attend but the family is responsible for transportation. The board I currently teach in is quite rural and there are no programs of choice that I’m aware of. I live in a large urban centre (from a northern perspective) and transportation has some impact, but I guess it really comes down to not having the population base that other boards/larger cities have. Some high schools struggle to keep a breadth of regular programs viable/staffed, but luckily some e-courses are available. How refreshing to see this from a school administrator! Principals and even Superintendents in the US are beginning to see the terrible folly of so many of the education “reforms” which are actually designed to undermine the public system. Vouchers and all other forms of school choice will be the slow (or not so slow) death a public system, because public does not just mean “publicly funded” but also a public good that every citizen has equal access to. And this is where school choice fails, just as Chris has noted.